3. Favorite Map:Hellendoorn-What ya think? Berlin? 7. Do you have Windows Messenger?Do you think so? 9. Do you Xfire? If you do whats your username?Nope, can download if necessary. 10. Do you have a Gaming Video Recorder? like Fraps?Nope, can download if necessary. ** 21. Have you ever used hacks of any kind in Battlefield( please answer honestly)?Nope, I don't need any. Deathwatch is my friend, I like the game. End of story. You may notice me and Deathwatch have the same IP address, because I'm at his house at the moment lol. lol " deathwatch is my friend. I like the game. End of story." 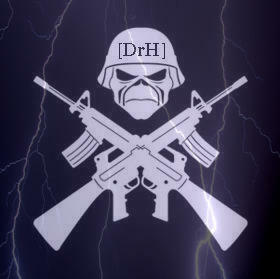 Ranger wrote: lol " deathwatch is my friend. I like the game. End of story." Better than anything you could every write. Who the hell are you to question me Ranger? Your just a random player and a member on these forums. haha i never questioned u in the first place. Ranger wrote: haha i never questioned u in the first place. Lol, yay, Cozza is back. Lol, and guys, this is gettin little off topic? DrH Professor Mjr wrote: BlackDreath?